This treatment involves removing the hair follicles quickly and gently by means of a simple sliding movement (One Glide®). The device used features a highly advanced, patented cooling unit, which in turn ensures optimum comfort. Hyperpulse® is unrivalled in terms of how gently and effectively it removes hairs. Suitable for all skin types (1-6), including dark and sun-tanned skin. Treatment possible throughout the year. Works with Hyperpulse® spray as opposed to unpleasant gels. Hyperpulse® spray has the added advantage of caring for your skin. What makes Hyper Pulse so revolutionary? It removes hair at unparalleled speed, even lighter and finer hairs. 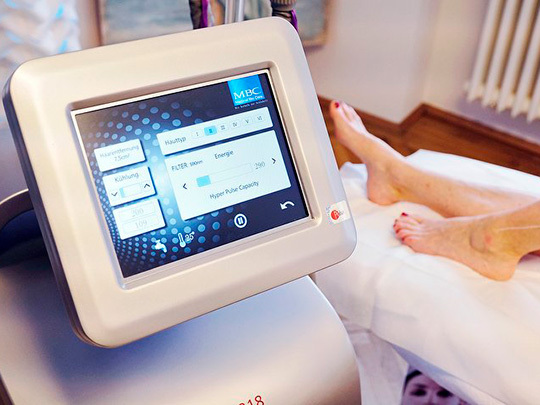 Its high-performance cooling system ensures that the treatment zone remains optimally cool.